1. Decoring your home or store in Loft Retro Industrial style. 2. Make your life easier by installing a few pipe shelf to efficiently create a storage space for your home or office. 3. Made of good iron material, strong hardness.not easy to break,very durable. 4.Perfect for industrial and rustic furniture, shelving and other projects, steam punk etc. ★ Durable Material: our industrial shelf bracket is made of high quality iron material, painted black matt, strong hardness. ★ Make your life easier by installing a few pipe shelf to efficiently create a storage space for your home or office. ★ Application: Perfect for Custom shelves, Floating shelves, Plumbing Pipe Shelf, Restoration. ★ Flange Diameter: 85mm/3.34 in, Short arm: 100mm/3.93in (including flange and elbow), Long arm: 150mm/5.9in (including flange and elbow). ★ Package included: 2x Pipe Shelf Bracket(Boards are Not included). If you have any questions about this product by TLBTEK, contact us by completing and submitting the form below. If you are looking for a specif part number, please include it with your message. 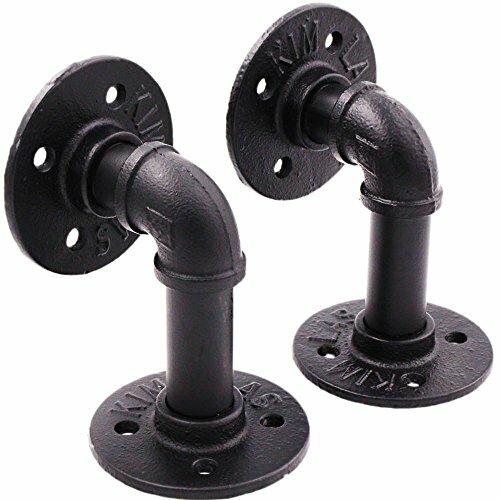 4 Pack 10” Iron Pipe Shelf Mounting Brackets Industrial Black Steel Iron Straight Shelves - DIY Rustic/Chic and Vintage Decor Floating Shelves Complete Display Set ½ Inch Flange - by NODNAL Co.